AAUW Morgan Hill actively supports our local community, both as an organization and as individual volunteers, Our members have created and implemented local programs for girls and women, in addition to supporting AAUW California and national AAUW programs at a local level. The branch also provides grants, recruits volunteers, co-sponsor programs, and provide publicity for local non-profit organizations. Branch support is conditional upon the organization’s goals being consistent with AAUW’s mission: AAUW advances gender equity for women and girls through advocacy, education,and research. 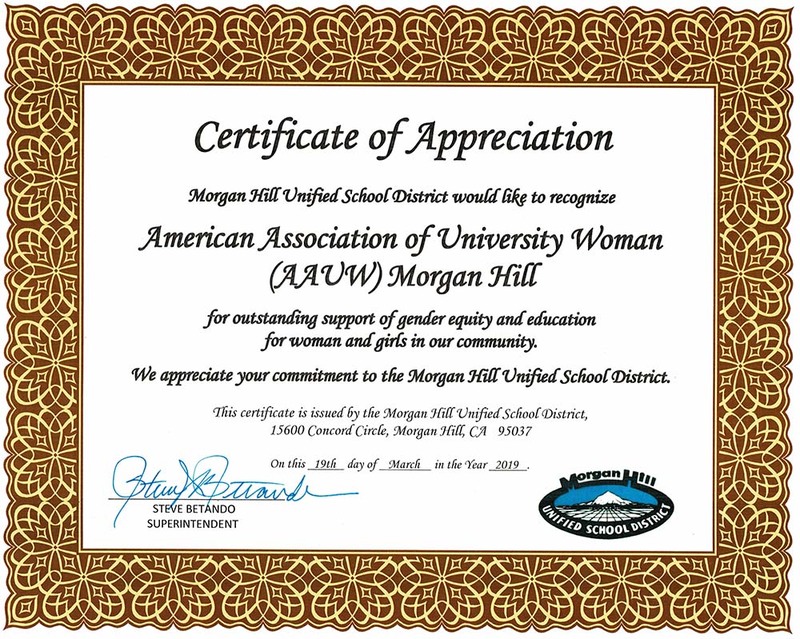 We are proud to have recently (March 2019) received recognition from the Morgan Hill Unified School District for our “outstanding support of gender equity and education for women and girls in our community” and our commitment to MHUSD. Candidate Forums: During election years, AAUW Morgan Hill hosts or co-hosts a local candidate forum. In addition, the branch publicizes other local, non-partisan candidate events. Morgan Hill now has voting districts for both school board and city council, limiting who can run and whom you can vote for. Our 2-18 program demystified the campaign process, helping prospective candidates better understand roles of elected officials. Video of AAUW’s program on civic engagement (running for office and expectations of local elected officials) created by the City of Morgan Hill. We have educated community members on ways to effectively contact their elected officials to make their voices heard. Voter Registration Drives: Each June AAUW Morgan Hill spends a morning on campus at Live Oak and Sobrato High Schools (during senior checkout) to register high school seniors to vote. We also conduct voter registration drives at Gavilan College. AAUW member contact is Yvonne Randolph. The success of our annual Wildflower Run enables us to now provide multiple grants of up to $1000 each to local non-profit community organizations, for projects whose goals are consistent with AAUW’s mission. Applications are due in the fall for grants issued for the following year. Click here for past recipient information, guidelines, and an application form. AAUW member contact is Susan Rife. AAUW Morgan Hill co-sponsors the annual Silicon Valley Reads guest speaker program at the library. The branch also publicizes other Friends of the Library events. For more information go to Friends of the Library; AAUW member contact is Carol O’Hare. This unique AAUW Morgan Hill group mentors girls in grades 7-12 through field trips, speakers and activities in the areas of science, technology, engineering and math. For more information go to GEMS. AAUW member contact is Susan Oldham-Fritts. This is America’s largest discussion program on world affairs. It provides background information and policy options for the the eight most critical issues facing America each year and serves as the focal text for discussion groups across the country. The Morgan Hill members of this organization meet monthly for eight months of each year to discuss a specific international topic. AAUW member contact is Joanne Rife. KIVA provides micro loans in developing countries. with special focus on education. Go to KIVA Team Morgan Hill for more information and/or sign up with Team Morgan Hill on the KIVA website. AAUW member contact is Margaret McCann. This nation-wide study, coordinated by AAUW, assesses equity in high school sports and compliance with Title IX regulations. For more information go to Know the Score. Several years ago, the Morgan Hill branch of AAUW worked with the local high schools on an assessment of local compliance with Title IX. For details of local compliance and contact information for local Title IX coordinators, go to the Title IX page of the MHUSD website. AAUW member contact is Joanne Rife. AAUW Morgan Hill encourages our members to expand their contributions to–and leadership within–the Morgan Hill community. Each year we sponsor branch member participation in this community leadership development program. For more information go to Leadership Morgan Hill. AAUW member contact is Janet McElroy. Branch members volunteer regularly at the Center, helping immigrant women develop English proficiency. The branch also has adopted the Center as the annual holiday beneficiary of member gift card donations and they have been the recipient of AAUW Morgan Hill Community Action Grants (for class materials). For more information go to Learning and Loving Education Center. AAUW member contact is Barbara Palmer. AAUW Morgan Hill provides docents for the Morgan Hill House and Historical Museum at Villa Mira Monte. The branch also publicizes Historical Society events to members. For more information go to Morgan Hill Historical Society. AAUW member contact is Kathy Sullivan. This is an AAUW California sponsored annual speech competition. Locally we offer the competition to all high school students attending Morgan Hill schools. The Speech Trek program creates a forum for students to gain exposure to gender equality issues and to develop their communication skills. The contest involves high school students writing and delivering a persuasive speech at a local branch meeting. The top three competitors in the state advance each year to a state-wide competition (and our branch has had two students advance to the state level). Go to Speech Trek. AAUW member contact is Joanne Rooney. A branch member provides advice to the Women’s Advocacy Clubs (WAC) at Live Oak and Ann Sobrato High Schools. WAC is committed to promoting equality on campus and in the community through educating people on the power of words and defying societal expectations to empower women to reach their full potential as strong contributors to the world around them. AAUW also guides these clubs along with a chapter of Girl Rising (and Oakwood School) in creating and implementing an annual Future Women Leaders Conference each spring. AAUW member contact is Margaret McCann. Thank you to our AAUW Morgan Hill members for their 2017-18 donations to the Wildflower Fund.